← CASINO ROYALE, THE WORST POOL IN VEGAS? 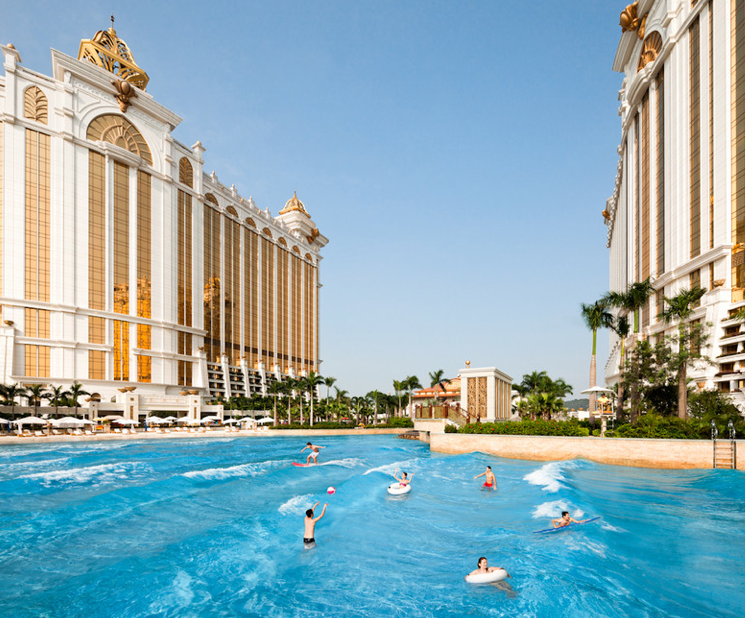 Turns out the wave pool at The Galaxy, Macau, is somewhat of a disappointment, to one reporter at least. You know how we hate that bait and switch (remember this). He says the resort only has one surfboard and the waves aren’t strong enough to support the weight needed for propulsion. He even tried with a boogie board but had no luck, and had a kid try on a boogie board as well. What a bummer! And then find out the truth here. 2 Responses to "THE GALAXY, MACAU"
I manage this wave pool. Just to give an accurate update, since the water is not salt water and therefore not so buoyant, surfing requires a different skill set than surfing per example in the sea. The guys you see surfing are actual staff who learnt to surf pre-opening in around a day or so, it normally helps to get some speed up before the break of the wave and without the extra buoyancy its not so easy. This photo is not a fake. The wave machines are surifng training wave machine, so dont expect a Haiwaii 30 footer craching down with a huge tube. But surfing is very possible. Trust me I have seen it, and kids love it. And i’m not critisizing anybodys surfing skill. Thanks for your comment and for the update. We love hearing things like this. We hope to come check it out someday!